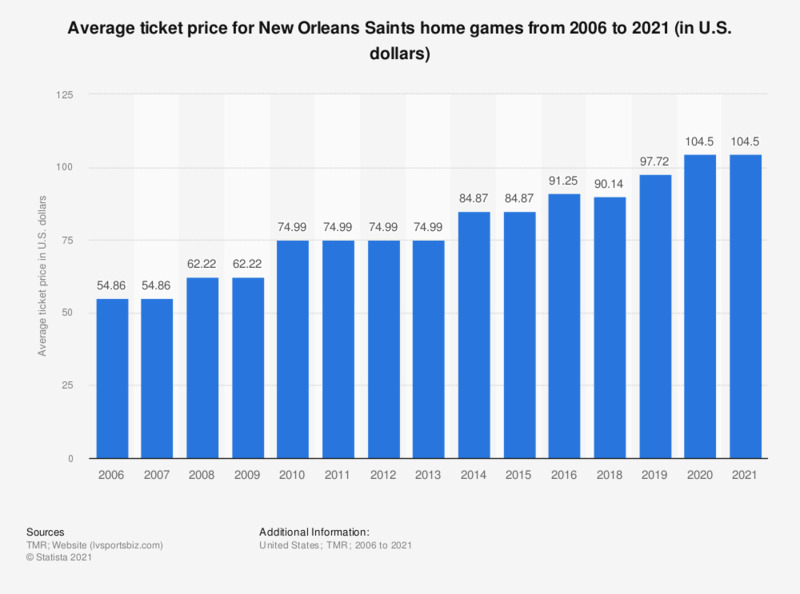 This graph depicts the average ticket price for New Orleans Saints games in the National Football League from 2006 to 2018. In 2018, the average ticket price was at 90.14 U.S. dollars. * The average ticket price represents the weighted average price across each team's general seating categories. The average weighted price factors number of seats sold for each category with the cost for each seating category to "weight" pricing by percentage of the total number. Season ticket pricing is used for all seats when offered. This takes into account if a team offers multiple tiers. When a seat category is not offered as a season ticket, the team's weighted average single game price is used. Premium seats (tickets that come with at least one added amenity and classified by team as premium) are not included to calculate a team's average. Luxury suites are excluded.